With the recent achievements in boating technology, inflatable kayaks have seen a huge spike in popularity over the recent years. Inflatable kayaks are usually more affordable than their hardshell sit-in or sit-on-top kayak counterparts, but offer just as much if not more versatility! 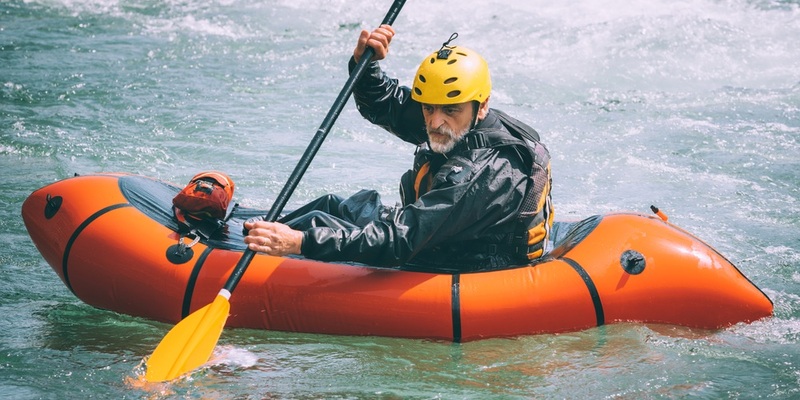 Whether you are a beginning fisher, recreational kayaker, or like to take on class IV whitewater rapids, inflatable kayaks offer perks that appeal to a wide range of outdoor enthusiasts. Before you begin searching for the best inflatable kayak on today’s market, it is important to keep in mind what features you’ll be using most out on the water. Because inflatable kayaks can be used for so many different fresh or saltwater activities, you should make sure that you pick the kayak that will best suit your needs for the activities you enjoy! The first thing to keep in mind is this golden rule: You get what you pay for. While that kayak under $100 may look nice at first, the cheaper kayak materials are not made to last, and you will end up needing to replace or repair it quicker than you probably realize. 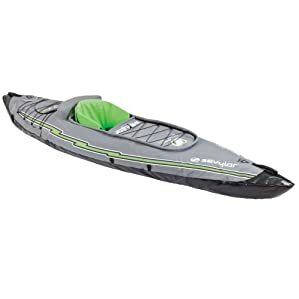 Instead, we recommend purchasing a kayak at least over $300-$400, as well as a kayak that is made with a durable PVC, Hypalon or Nitrylon outer shell. This will ensure that you’ll be able to use your kayak for years to come, as long as you properly use and store it. Speaking of storage, one advantage of inflatable kayaks over hardshell kayaks is the ease of storing and transporting them! Because they can inflate and deflate, most kayaks will pack small enough to fit in a car, duffel bag, or even an overhead carry-on (for those adventure kayakers out there). Most inflatable kayaks will weigh in from 25-50 pounds, so if weight and size are important to you, it is important to keep those in the back of your mind while reading this review. Another thing to consider is whether you would prefer a solo or tandem inflatable kayak. Solo kayaks are great for a whole host of activities, are generally better to maneuver with, and handle well on whitewater rapids. Tandem kayaks, on the other hand, are better for fishing or whitewater rafting and provide a more comfortable and social experience, but may not be quite as maneuverable as solo kayaks. Luckily some kayaks, such as the Advanced Elements AdvancedFrame Convertible Kayak, can efficiently convert from solo to tandem. Overall, we’ve narrowed it down to a few different key points to consider while shopping for an inflatable kayak. 1. Variability – Which activities do you need a kayak for? If it’s fishing, we suggest a large, comfortable kayak with space for your gear. If it’s whitewater rafting, a more streamline and narrow kayak would be best. 2. Portability – Again, weight is a big factor. Most kayaks pack down very well, but if you plan on traveling extensively with your kayak, it is important to find a kayak with a low weight and a small carrying case. 3. Durability – Kayaks are either made with reinforced PVC, Nitrylon, or Hypalon shells. Nitrylon – Introduced by the Innova brand, this is eco-friendly, abrasion-resistant, and stronger than traditional PVC kayaks. Hypalon – This material is stronger, longer-lasting, and more UV-resistant than PVC. It handles the elements and long water exposure well, but is generally more expensive. 4. Cost – Know your budget, and pick a good kayak under that budget; just also know that a budget kayak will not last nearly as long as a kayak $200-$300 more expensive. We’ll explain more in-depth about how to use your kayak later, but let’s first take a look at the 8 best inflatable kayaks we feel are out on the market today. After all the research we did and feedback we’ve heard, we think the Sea Eagle 370 is the all-around best inflatable kayak on the market today. It is one of the most popular and highest rated kayaks today, for good reason. 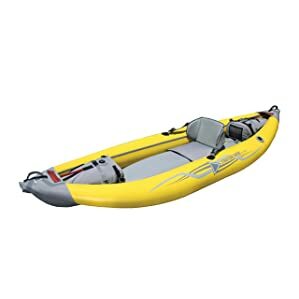 Sea Eagle has a great reputable brand name, being in the industry for 1968, and is most well-known for their well-priced top of the line inflatable kayaks. The Sea Eagle 370 takes on all the features of the award-winning 330 model, and in, our opinion, improves them. It comes in at 32 pounds, and has room for 2 or even 3 people, while still remaining super portable. 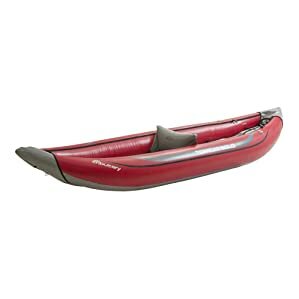 It is 6 pounds heavier than the 330 model, giving it extra durability, and making it great for taking on unforgiving whitewater rapids or ocean waves. The 370 is self-bailing, constructed of 38-mil PolyKrylar, and is overall the most durable and versatile model we have on the list. 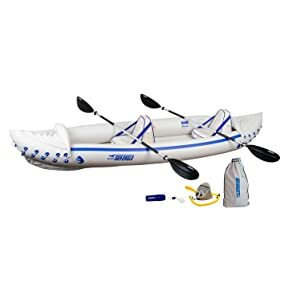 The Amazon set comes with 2 paddles, 2 inflatable seats, foot pump, carry bag, and repair kit. 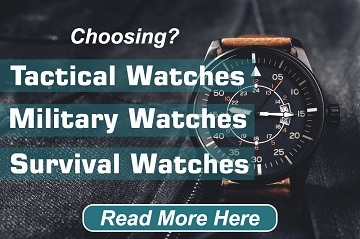 This is one of the more roomy models on the market, while still maintaining the durability and technical construction that won it so many awards in the first place. Overall, it will appeal to both veterans and newcomers to kayaking alike. The Advanced Elements AdvancedFrame series has been another popular series with kayakers, and usually competes directly with Sea Eagle’s kayak. This kayak is definitely a step up from their popular StraitEdge model, which we have also included lower down in our list. It is noticeably heavier than the Sea Eagle 370, at 51 pounds, but still packs down fairly well. This is a tandem convertible kayak, but with 3 seating positions, can be used a number of different ways. This makes it a great kayak to use tandem, and can still easily be turned into a roomy solo kayak. 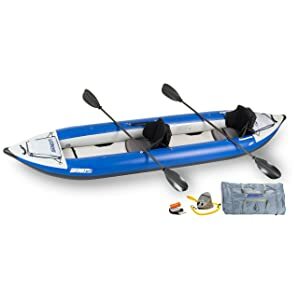 This is one of the easiest kayaks to set up – it comes factory-assembled, so all you have to do is unpack, inflate and attach the seats before taking it straight to the water. In its pre-assembled design comes built-in aluminum ribs for better tracking, an interchangeable deck, and a skeg tracking fin. 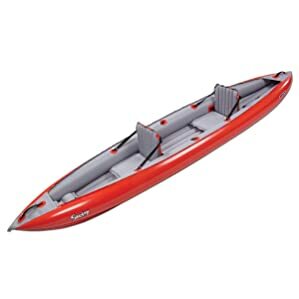 This makes for a smooth and easily maneuverable boat, and one that is a great choice for either a solo or tandem kayak. The Aire Tributary Tomcat is a great boat for those looking to get into whitewater kayaking. It comes in either a bright blue or red finish, and is made of 1000-denier PVC. This kayak features bow and stern dodgers, multiple tie-down loops, and a mesh draining system. The bow and stern dodgers surround a kayak that can cut through standard rapids with ease. The tie-down loops make storing gear for long-day or overnight trips easy. The drain system ensures that even on harder rapids, you will stay upright and have a good (fairly dry) time. This is offered in both solo or tandem versions, and both are equally comfortable as they are durable. Overall, this is a pretty decent kayak, but is one built with the beginning whitewater adventurer in mind. If you are just getting into the sport, we heartily recommend this one. Keeping with the class of whitewater kayaks, the Advanced Elements StraitEdge will appeal to more seasoned whitewater enthusiasts. Like the other Advanced Elements kayak in our list, this comes with built-in aluminum ribs to prop up the bow and stern and improve tracking, especially on more difficult whitewater rapids. It also comes pre-assembled, and is extremely easy to set up and take down into its included duffel bag. What makes this kayak perfect for intense whitewater use is its self-bailing mechanism. The StraitEdge is designed to bail itself in strong waves and close its ports in calm water, making it great for tracking in a number of conditions. Overall, this kayak can handle up to class III rapids with ease, and is one of our favorites to use for whitewater rafting. The Sea Eagle 420x Explorer is our favorite kayak for class IV or potentially class V whitewater rapids, as we feel that it has all the functionality of the last 2 kayaks in our list, but with better durability and handling. This weighs 42 pounds, fits into a large included duffel bag, and has a weight capacity of 2-3 adults, or 855 pounds. It is constructed of 1000-denier, and has features that make it great for advanced whitewater rafting. Like the AE StraitEdge, it also has a self-bailing system that allows it to bail in heavy waves and close for open waters. This assures you will remain extremely dry during your kayaking. One of the main reasons we enjoy this kayak is the introduction of the removable center skeg. 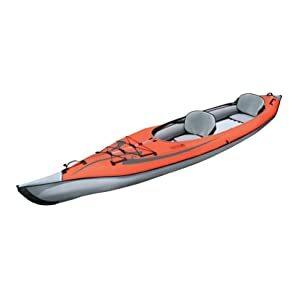 With the skeg attached, you can easily use this kayak on open waters; however, you can remove it while whitewater rafting. The floor is double reinforced, making it smooth over bumps and large rocks found in whitewater. Complete with bow and stern storage bags and carbon fiber paddles, this kayak is great for more advanced whitewater rapids. Coleman’s kayak brand Sevylor has made a good kayak at a great price in the Quikpak K5. This kayak is built with 24-gauge PVC, and includes multiple inflation chambers. The multiple chambers are a good feature for this model specifically, as it is easy to puncture, and may require repair early on down the road. This model includes D-rings for attaching gear to the kayak, and has a pump and paddle included as well. 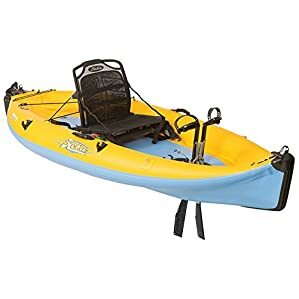 If you are looking for a cheap model to use solely for non-technical kayaking on lakes or streams, this is a good beginning kayak to check out. Unlike most other kayaks in our list which were sit-on-top models, this is very much a sit-in. With this sit-on-top, it is much easier to get water stuck by the seat and leg areas. We grew tired of this very shortly, as we got pretty wet by the end of the day. Ultimately, we would prefer to spend the extra money for a better kayak; however, for the ridiculously low price and Coleman brand name, we had to include it on our list. The absolute best inflatable fishing kayak on the market comes from the same line as its award-winning hardshell kayaks – the Hobie Mirage series. The Mirage i9S is constructed of 1000-denier PVC, is 9 feet long, comes at a fully rigged weight of 70 pounds, and can hold up to 325 pounds with a single person inside. This boat has a few features that make it perfect for fishing. The first is its drop-stitch floor. This floor pattern creates an extremely rigid and durable bottom, while still allowing for higher inflation patterns. The kayak has great storage capacities in the bow and the rear for long day or overnight trips. The most appealing feature for fishing enthusiasts, however, is Hobie’s MirageDrive 180 propulsion system. This is a hands-free device which allows you to maneuver swiftly and effortlessly, as well as go from forward to reverse in a split second. Overall, this kayak has all the features that a kayaking fisher would love – portability, great features, and lots of space for gear. If you can manage the high price tag, we definitely recommend this for fishing. The Innova Sunny kayak is a 33 pound, 12’8″ long inflatable kayak, with a 1200-denier Nitrylon rubber construction. What does this mean? You’ll have a strong, fast, and durable kayak for years to come. Like the AdvancedFrame, it can easily convert from solo to tandem. It is built with 3 inflation chambers, and can be taken from bag to boat in under 10 minutes. Its comfortable seats with adjustable back support, adjustable foot rests, and movable tracking fin make for a comfortable and fun time on the water. While it cannot handle whitewater rapids very well, it is great for smaller-caliber activities such as fishing and river or lake kayaking. One downside to this model is that with its very open cockpit design, water can easily get in, especially when dealing with stronger currents. This design makes it more stable than other kayaks, but understandably more wet as the day goes on. One of the main draws to this bag is its size – it packs down small into its dry bag, which converts into a backpack with adjustable shoulder straps. Overall this is one of the easiest kayaks to travel with. 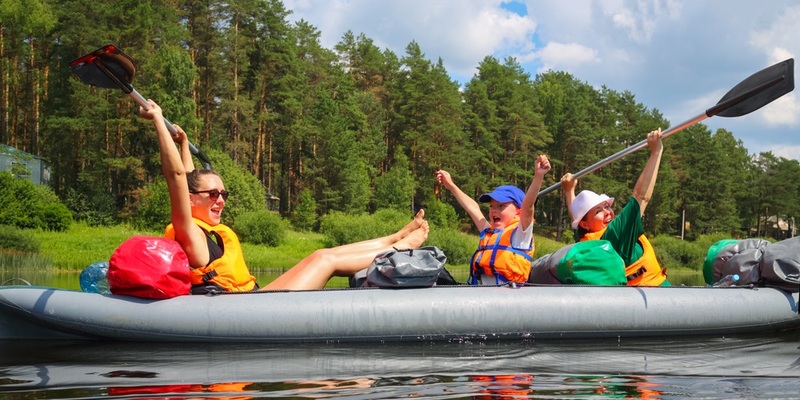 So now that you have an idea of which kayak you should get – whether for fishing, whitewater rafting, or simply just going out with friends – it is important to know how to use your kayak. Here’s a couple of tips on inflating, using, and storing your kayak once it’s yours! 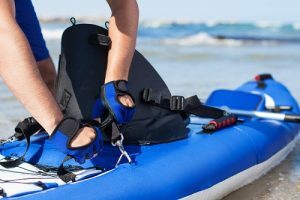 Overall, using an inflatable kayak is a cheaper and easier alternative to hard-shelled kayaks, and they can be used a number of different ways. All of these kayaks are great in their own rights – however, the one you choose should best reflect your interests. With the right inflatable kayak, you’ll be a master whitewater rafter or an expert angler in no time! Bought in 1974 a Sea Eagle Exployer 340 never a problem except replacing a couple of o rings and purge valve gasket over all these years. A quality product that has lasted over 40 years ! Interested now on buying the 380x model. Wow! Such an awesome post.This is a great article thanks for sharing this informative information.I am a regular reader of your Blog and I love every piece of information you share here. You presented it in a very beautiful way.I learned a lot of things and was very inspired. Wow! Such an awesome post.This is a great article thanks for sharing this informative information.It’s very helpful site .